More than a novelty, this is a fantastic round form a producer with an excellent reputation making ammunition in calibers just like this one: 8x57 (8mm Mauser). 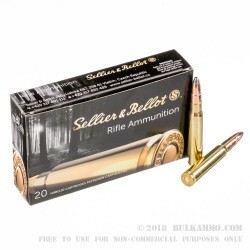 The High-quality build of this cartridge is what Sellier and Bellot is famous for, especially in the military rifle rounds arena. You can expect better than military surplus accuracy and a much better hunting performance due to the novel “Cutting edge soft point bullet”. This 196 grain projectile operates like a tow part bullet, by having the tip push backwards into the bullet base and creating uniform expansion, unlike FMJ ammunition. The design has been popular for some of the more ancient rounds that S&B is producing that still have good followings from hunters who have sporterized versions of older military weapons and need a good performance out in the field when hunting (specifically) big game. The controlled expansion offers hard hitting hunting performance without the added R&D costs or component costs of modern engineered bullets like those found in ultra-premium hunting cartridge brans lines. 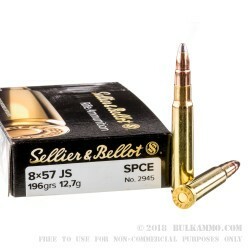 The Sellier & Bellot SPCE in the 8mm Mauser cartridge with Boxer primed, reloadable brass is a solid choice for those who don’t handload and want to pay a good price for a performance oriented round that doesn’t costs the same as the factory ultra-premiums do. Q: It is true that the 8mm Mauser was designed by the Germans to penetrate brick and concrete to kill persons on the other side of the wall? A: No, that is not true. Q: Is this a core lock round applical to big game hunting or a target round? A: It is a core-lock type. The manufacturer describes it as "a semi-jacketed bullet with a cut-trough edge in the jacket which partially locks the lead core at the same time. The bullet effect depends on the target resistance – it gets deformed in light game to a lesser extent than in heavy game. It is appropriate for cloven-hoofed game hunting." Q: i understand the "soft point "part but can you explain what the cutting edge is ? A: There is a special cut-through edge - almost a crimp - along the ogive (curved forward portion) of the bullet that partially locks the jacket to the core. This means that the bullet will retain weight well, even if it hits a toughly constructed target. Q: How does this ammo compare with MILSURP 8mm ammo. Is this ammo that much more accurate, cleaner, or reliable than MILSURP out of a Spam can? Thanks. 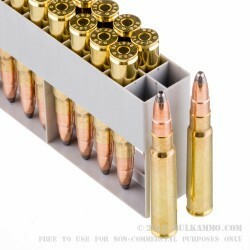 A: This is new production 8x57 ammo manufactured with boxer-primed brass cases that can be reloaded. It also utilizes non-corrosive primers, meaning that it has no special cleaning requirements. Because this 8x57 ammo is new production, the chances of it failing to fire are practically zero. None of the above can be said about military surplus 8x57 ammo from a spam can. Q: Does this ammunition use corrosive primers? A: No, this Sellier & Bellot ammunition does not use corrosive primers. Q: I was doing a little research on this cartridge and I noticed that sometimes, these are referenced as 8x57mm IS and sometimes with a J, like 8x57mm JS. What is the difference between the two? This can definitely be confusing, and the reason is that many minor changes were made to the 8x57 cartridge over the years as it was adopted by various militaries and used in civilian hunting rifles as well. The simple answer to your question is that the "I" on some German rifles (which stood for "Infantry") was misinterpreted as a "J," and the mistake stuck so well that it eventually became the commonly used name of the cartridge. In other words, 8x57 IS and 8x57 JS are the same cartridge - a .323" bore and a non-rimmed case. 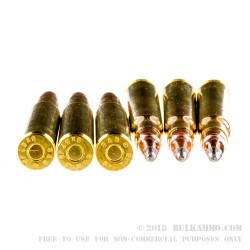 However, there is more you should know about 8x57 ammo. You will also see 8x57 JRS, 8x57 JR, and 8x57 J. The "R" stands for "rimmed" and is intended for use in break action weapons - ammo without the "R" is designed for bolt actions. Without the "S" in the name, the projectile diameter is actually different as well - .318" for the "non-S" and .323" for the "S." Prior to 1905, German rifles were manufactured with the .318" bore diameter. If you have an 8x57 rifle, you should make sure that you know the chamber dimensions and bore diameter before buying ammunition for it. While shooting .318" projectiles in a .323" bore will only result in poor accuracy, doing the reverse is potentially hazardous.